Mosquito saliva alone—even in the absence of any pathogens—contains hundreds of proteins. Now, researchers reporting in PLOS Neglected Tropical Diseases have discovered that the interaction of these proteins with the human immune system causes an immune response that can be detected for days after a mosquito bite. Around the globe, 750,000 people a year die of mosquito-transmitted diseases, including malaria, dengue, West Nile, Zika, and chikungunya fever. Previous studies have shown that properties of a mosquito bite—including mosquito saliva—exacerbate some of these diseases; in mice, infections caused by a mosquito bite are often more severe than those caused by needle injection of the parasite. In their new work, Rebecca Rico-Hesse, of Baylor College of Medicine, USA, and colleagues studied the effect of mosquito bites on human immune cells in mice engrafted with human hematopoietic stem cells—leading the animals to have components of a human immune system. They studied small changes in the levels and functions of these immune cells after each mouse was bitten by four mosquitoes on their footpads. After getting bitten by mosquitoes uninfected with any pathogen, the humanized mice showed multiple types of human immune responses, with altered Th1 and Th2 T helper cells and an increase in the levels of cytokines. At various points during the immune responses, there were also increases to levels of natural killer T cells, natural killer cells, CD8+ T cells, mononocytes, and macrophages. Overall, evidence of the immune responses lasted up to 7 days post-bite and were seen in multiple tissue types, including the blood, skin and bone marrow. 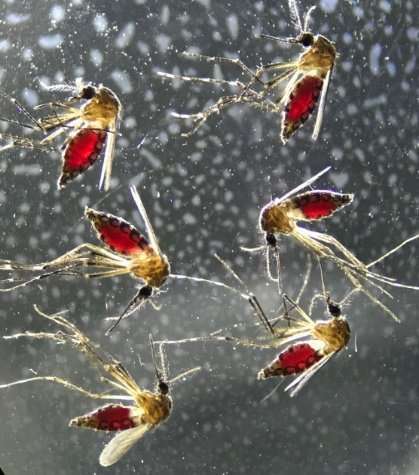 "Understanding how mosquito saliva interacts with the human immune system not only helps us understand mechanisms of disease pathogenesis but also could provide possibilities for treatments," the researchers say.